I have a huge stage fright, not kidding. I don’t have any problem talking in intimate places in front of a group of people I know well, but the moment I need to talk in front of a bigger audience, I get super nervous, confused and nonsense comes out of my mouth. I’m not sure where this started but I clearly remember one instance from when I was a kid. At about 12 years old, I was supposed to play at a recital. This was a very exciting moment for me and I practiced in order to be perfect. Unfortunately, no matter how good I was and how much I practiced, when time came, the nervousness hit me and I didn’t perform at my best. When I analyze this topic, I realized that the origin of this nervousness come from a fear of failing in front of a group of people that I don’t know. This fear is huge. It’s not just the fear of public speaking, it can appear at any occasion that my voice or words will be heard or read by a group of people I don’t know. Even on this very blog. This fear caught me on a lot of occasions. More than I would ever like to admit, I had my share of well-written social media comments or posts that were deleted just before I hit the submit button because I was afraid of the reaction by people I don’t know. This fear follows me in a lot of places, and even though I can’t dismiss it, from time to time I do find ways to get around it. When I started to work at Sears Israel, we were a small company. Each day, we had a daily standup meeting (DSM) that included R&D, Product, QA, etc. This meeting took around 15 minutes and during this time each person updated what he is working on today. You can imagine how this kind of meeting influenced me. Although I needed to say only about two sentences, each day was a complete torture for me. Every day, I needed to nervously wait for my turn to speak while trying to rehearse what I’m going to say in my head. And unfortunately for me, every day I messed up and forgot part of the stuff I wanted to say or just said nonsense. This experience was even more horrible due to the fact my team was located at the end of the speaker’s circle. As a result, I was among the last people to speak and because I was too busy trying to rehearse what I’m going to say, I couldn’t even listen to what other people said. From an important sync meeting, this became a complete waste of time for me. I tried all kind of ways to solve this issue. I started by getting ready 5 minutes before the meeting and wrote down what I’m going to say. This worked only partially — the nervousness didn’t pass, but I was more coherent in what I said. When I thought of what is the main issue with this meeting, I realized that it was the time I needed to wait that, so I decided to shorten this time. One morning, I just moved away from my team and stand at the front of the line of the speakers. This simple change solved this issue for me. I spoke among the firsts, I didn’t have to wait for the agonizing 10 minutes in order to speak and the fact that I knew I’m getting rid of this hassle quickly helped me be more focused and speak more clearly. As a bonus, after I spoke, I could actually listen to what other people said because I wasn’t nervous anymore. Simple solution, big gain. Win. Another issue I wanted to solve for myself is the nervousness I had while presenting in front of small group of people. I had several meetings that forced me to present about a various topic I lead in the company. As expected, every time was a complete mess. Every time I needed to present, I wasn’t focused and couldn’t get my message right. The hack I applied in order to solve this issue for me was presenting while standing up. For some reason, I’m much less stressed when I speak while standing. Something in standing allows me to be much more focused on my presentation. Since I discovered this, every time I present, if applicable, I’m presenting while standing. I don’t really care if all the other people are presenting while sitting. Another simple hack, another win. All those small hacks helped me with controlling my nervousness in front of a small crowd, but for years I ran away from speaking in big occasions in front of a big crowd. At the beginning of the year, I set myself a goal that this year it will happen. Although I was terrified and didn’t know if I could pull this off I looked for opportunities. The opportunity arrived in a form of a co-presenting session that we did with an engineering organization of a well-known tech company. In this session, each company lectured on a specific topic to the other company. The topic of this session was mobile and as the lead of the mobile group in the company, I decided to take this opportunity and present. We are talking about first time lecturing. If this isn’t enough, at the same time I will also present to my own company because this is a co-presenting session. And last but not least, the presentation was in English — not my native language which took the difficulty to another level. Personally, I felt that this is like accelerating from zero KPH to 100 KPH in one second. I had all the excuses I needed to drop this opportunity. I decided that this is going to be my challenge. If I can do this, everything else will be (relatively) easy. I started to work on my presentation. I practiced a lot with the help of some super talented people in my company and got feedback that helped me improve along the way. Unfortunately, all this practice didn’t help my nervousness. To put it in proportion below is a graph of my heart rate for the week I had the presentation. Can you spot in which day my presentation took place? At the end of the day, the presentation itself wasn’t 100%, I had some hiccups and it wasn’t close to the level I reached during my practices, but you know what? The reason that it’s ok is because I learned a lot from this experience. First of all, this was the first time I wrote down all the great things my team is doing for the past few years and presented it to the whole company which was amazing. Second, I learned a lot on how to present and about do’s and don’ts for this kind of presentation. And most important, I proofed to myself that I can do it and broke another glass ceiling for my growth. Every small hack that helped me face my fear had an impact on my growth and was another small win for me. The most important lesson I learned from this great experience was that sometimes, the only thing that stops you from moving forward is yourself, everything else is just your imagination. I was terrified at the thought of presenting in front of an audience and this influenced my life in many ways, not only in presenting. By taking this leap of faith and doing this challenge, I broke another glass ceiling and proofed myself again that the responsibility for my growth is mine and that glass ceiling is just in my head. Even when I write these lines, I can’t stop thinking about what will be the reactions once I’ll publish this post. You don’t want to know how many times the thought of deleting this post crossed my mind during its writing. But wait, can you hear that? This is the sound of another glass ceiling get shuttered. It’s been a while since I’ve posted new content to my blog and I decided it’s time for a new beginning. In the last few years, my context has shifted. As a result, the content of my writing will shift as well. Until now, I used my blog as a knowledge center mainly for myself and my writing was focused on technical topics. From now on my writing will focus on different topics like leadership, management and productivity which I deal with in my day to day. I hope you will enjoy reading. For the past week, I’ve worked on a big internet campaign that included a website where the users could connect to facebook using facebook connect and publish content from the site to their profile wall. 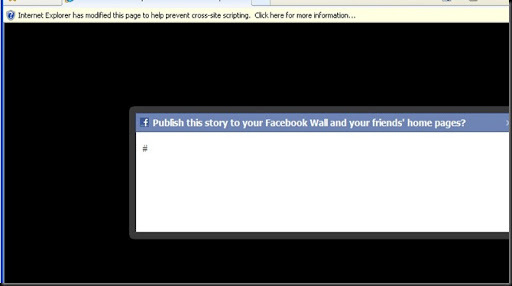 When I tried to publish the post on facebook I encountered an error I haven’t seen before and this error occurred only in Internet Explorer 8 , none of the other browsers (chrome, FF etc) produced this error and the content didn’t appear in the publish box. After googling didn’t give me the answer I tried to modify the content I pass facebook on the FB.Connect.streamPublish function and I discovered that the parameter of the user_text has a limitation of 95 non-English characters (my text was in Hebrew) cutting the text to less than the limitation fixed the issue! Twitter is my radio station, Google Reader is my disc player! I don’t have a single CD in my car (nor an MP3 player for that matter), my wife has about a dozen of CD’s that she listen to all the time and she always asks me how can I drive without music? Well, I can’t, but I love to listen to the music that is played on the radio and not from a CD. You are probably thinking what the heck I’m talking about?! and what CD’s or radio stations have to twitter or Google Reader?! Think about it like this, when you listen to the music from the radio you don’t really know which song will be played next and if you will like it or not. The anticipation for the next song makes the music on the radio somewhat more interesting and not predictable. In the other side when you listen to your favorite CD’s or MP3’s you basically know which type of songs you will hear and for me this is less interesting. Twitter is not predictable, when I wrote these lines I followed around 223 people that are divided into 3-4 groups and have another 3 search columns on various topics on my TweetDeck(great twitter client!). Every new tweet is a song that maybe I like or not but it’s not predictable. On my Google Reader, I read about 20 blogs on different topics but all my blogs are predictable, I know what to anticipate, I generally know which type of information I will get from those RSS feeds and sometimes it’s just plain boring. In the last couple of weeks I started to use twitter on a regular basis and found a whole new world of information, information that until know you needed to look for but twitter let you get the information right to your hands, all you need to do is just pay attention and read! Twitter is a huge information index and all you need to do is just know what you are looking for, someone probably already tweet it. I guess twitter will never replace my Google Reader completely because I love my blogs but twitter sure took the first place in the competition on my attention and because we are just humans and we have limited time to spend every day, my GR is now at the second place. I think that every time I’m in the mood to “hear a familiar song” I’ll go back to my good old Google Reader. Did twitter replace you disc player?